From our little Dorsett Golden apple tree. She makes crisp, flavorful apples, and more every year. There's only one problem... how many pies can we bake, sauces can we make?? We look forward to sharing these golden treasures. Nice crop of apples! I'm sure your friends will be delighted that you're sharing. I didn't know there were apples that ripened in June! That's wonderful, but then they also have more competition from other fruits being harvested right now. Good luck on sharing them :-) Do you have a dehydrator? These do ripen in spring, and so does the Annas apple... also yummy. But in the fall, when we expect apples, and wish for apples, ours are long gone. Still, I am glad we can grow any at all! We do have a dehydrator, thanks to my mom. 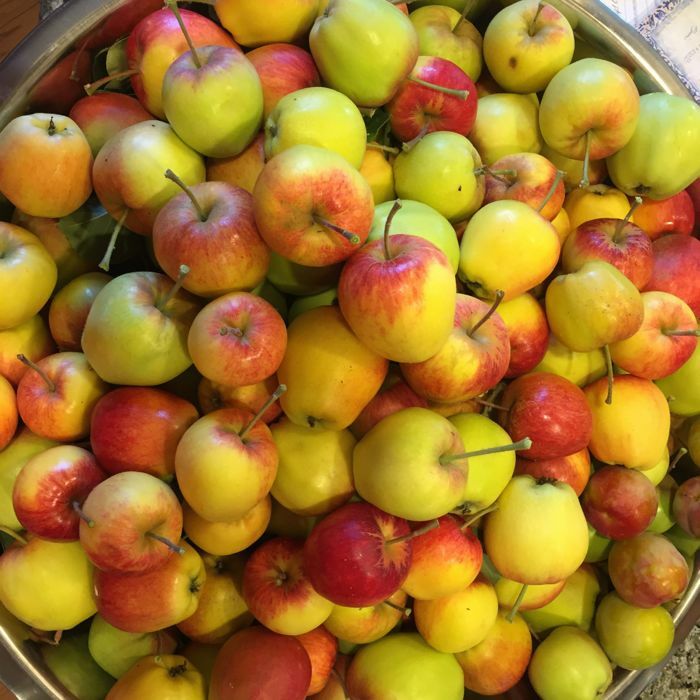 Alex wants to prepare some apples for drying, and good thing, too, because this giant bowl full is only one tree's worth, and our Annas is ready for harvest, now! We gave away many bags full of apples, and that was fun.